Reflex is the latest physical gameshow from Objective Productions and Adam Adler, creator of The Cube.Originally piloted for Channel 4 in the UK – the same broadcaster that piloted and passed on The Cube – it has been taken to series by UK pubcaster the BBC, which will launch it on its flagship BBC One channel in primetime in early 2014. Whereas The Cube was about hand to eye coordination, Reflex tests different physical reflexes. As with the earlier show, the emphasis is not on physical strength, meaning a relatively level playing field between the sexes and across different age groups. Like The Cube, which stretches to eight seasons on ITV in the UK, there is a slow-motion component to the action, but it is an integral part of Reflex, not a way of replaying game highlights. The new show uses the super high-tech NAC/Ikegami hi-motion camera utilised in the 2012 Olympics in a TV studio environment for the first time. 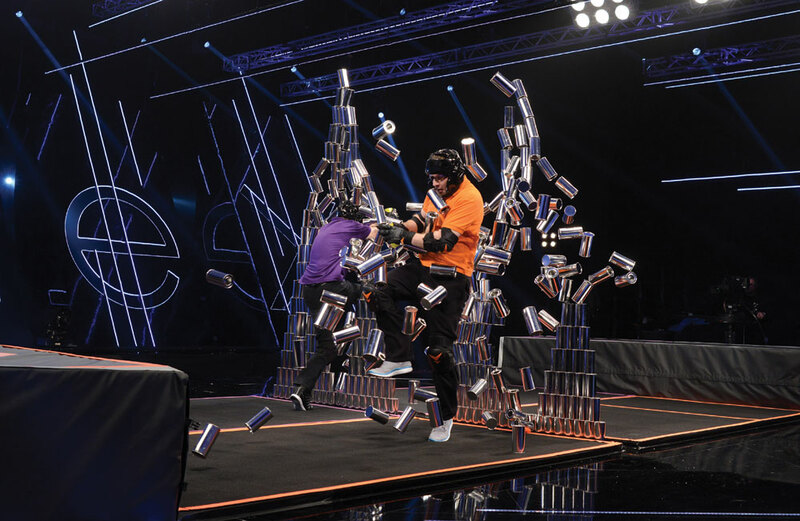 The family-friendly feel is accentuated by well-known British host Shane Richie and the tone of the show has drawn comparisons with Endemol’s Wipeout, although the look is very different with the set described by Adler as “very futuristic and Tron-like”. The pilot had individuals competing, but the finished show pits two families of three against each other. They compete in rounds testing their reflexes in various games across three head-to-head rounds. There is then a two-versus-two section and a group mental reflex round before one member of the winning family takes part in the end game. That involves them standing on a plinth and having green and red balls fired at them, the former earning them money as they are caught and the latter taking away from the total. The final twist is an all or nothing question in which the family can risk their winnings. The games themselves include leaping through glass panels and falling through giant balloons. All3Media’s sales arm is handling distribution of Reflex and managing director Louise Pedersen says the sales team will be using Adler’s Cube-shaped credentials when talking to buyers. On that basis, All3Media hopes to place it with broadcasters that have acquired The Cube as well as with some looking for a more cost-effective, more family-skewed shiny-floor show. Having searched for a big shiny-floor format, All3Media now has The Cube, Reflex and Million Second Quiz on its books. The Reflex and MSQ formats will be launching internationally at MIPCOM.